Visual impairment and blindness is a deeply personal and individual experience. Some people are highly motivated to set goals and regain their independence immediately, while others take it one day at a time. Never forget, whatever stage you are in your journey, a compassionate team of vision professionals, O&Ms, and resources are always there to support and help VI people along the way. You might think my classmates and professor were playing a vicious trick on me the day I was blindfolded. They led me around the winding corridors of my college campus until I was completely disoriented. Then they left me alone to my own devices. In reality, it was the first lesson in my master’s degree training program as an orientation and mobility (O&M) graduate student. The first day of the rest of my life. “I have no idea where I am,” I laughed nervously. Did I mention two of my biggest fears are “the dark” and “getting lost”? Fear is a funny thing we all confront at some moment in our lives. The nagging tic in the back of our brains, or the aching pit at the bottom of our stomachs. Fear can overwhelm in a flash of frustration and panic. Or, in a moment of enlightened courage, motivate us to actively change our circumstances and rise to the occasion. So, what was I to do? I could stay stuck, remain literally in a corner, and give in to my fearful thoughts. Or, I could choose to move forward and continue moving until I eventually worked my way to my destination. About 30 minutes later I used my long white cane and worked myself out of the corner. I located the stairwell, walked up two flights of stairs, only to take a wrong turn, on the wrong floor. Trapped again, in another corner nowhere near my final destination. By the end of that month, my professor was right. I had all the tools I needed and I crossed my first street independently while blindfolded, then another, and then a whole intersection. Eventually, I worked my way through many other environments after that first intersection. From parks with uneven terrain and dirt trails to riding public transportation in a congested center city. To taking escalators, exploring different departments in shopping malls, and my favorite lesson of all, training with guide dogs! When I wasn’t practicing cane navigation, I was learning to instruct my classmates. Lessons involved traveling systematically, safely, and independently while building their confidence and helping them achieve their goals. Now, months later, I’m nearing the end of my fieldwork and I’ve worked with visually impaired (VI) children and adult clients. Next, I’ll be moving across the country to train at a Veteran’s Hospital with visually impaired members from our nation’s military. Along the way, I’ve met incredibly diverse and unique people across the spectrum of blindness and VI. People who have welcomed me with patience, kindness, open hearts, and minds. Thanks to Stephanae, I’ve enjoyed this opportunity to reflect on my experiences and training as an O&M graduate student, and my hope for the future. VI and blindness is a deeply personal and individual experience. Some people are highly motivated to set goals and regain their independence immediately, while others take it one day at a time. compassionate, creative, problem-solvers who are as deeply invested in helping our clients identify resources, overcome barriers to accessibility, and achieve their goals. Life may never be the same, but quality of life can be enhanced through adaptation, creativity, and the emergence of innovative technologies. I am grateful to my classmates, professors, mentors, clients, students, and the VI community at large, for their patience and encouragement along the way. Though I know I will encounter barriers and systems that present challenges to my students and clients, I will always be a seeker and student, an advocate for equality and inclusion, and a warrior against fear in favor of love and light. In the coming year, I hope to find my place and purpose in this amazing community, and work hard to make a difference through passionate action. I look forward to serving the community in every and any way I can. Many thanks to Bold Blind Beauty for allowing me to share my thoughts and experiences. Please reach out to me at any time, so we can connect and continue to educate, overcome barriers, fight for accessibility and independence, and continue to grow and learn as a team. This photo is a group of nine O&M students (including Amy) posing with white canes. 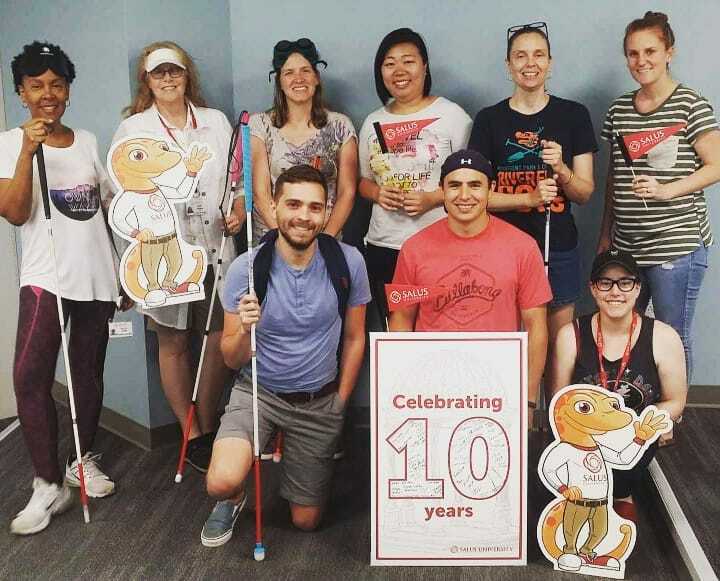 There’s a Salus University sign on the floor that reads “Celebrating 10 Years.” A couple of students are holding the school’s mascot (Sal the Salamander) and others are holding school pennants. A closeup of Amy with a big smile and wearing dark-rimmed eyeglasses. Her blond hair parted in the center and she has on a black cold-shoulder top. Amy and five other Salus University O&M students are posed standing with white canes. As part of her O&M training, Amy is approaching a set of escalators with her white cane as several onlookers watch. Amy is standing on the upper level of a mall next to the railing with her white cane. This image is a couple of students doing O&M travel on the street. A photo of three people demonstrating O&M on a wooded pathway. Amy is kneeling next to a lovely dog who appears to be smiling. A picture of Amy and four other students wearing white polos at Seeing Eye Guide Dog Training. Eight students (including Amy) are posing with three guide dogs. The three guide dogs are sitting on the floor with two students kneeling next to them while the others stand.